Seven Operations for Finding Meaning 2 is a joint project by visual artist and painter Antero Kahila and poet-musician Kirsi Poutanen. An impulse for the project was given by the poem Das Kind ist erstaunlich by Poutanen (from the book of poems Villonin puutarha, Helsinki: Tammi 2014).This multidisciplinary joint installation consists of three independent components and is a result of a chain reaction: first there was a poem that inspired a painting, which in turn inspired the audio piece heard in the gallery. 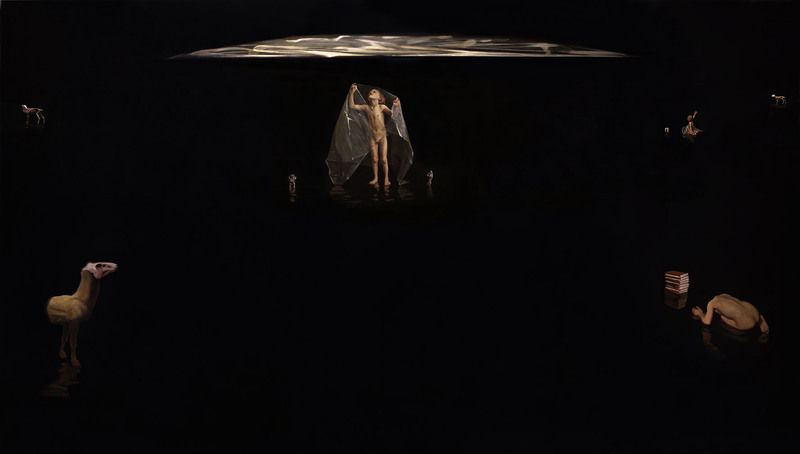 A large painting by Antero Kahila in the gallery is accompanied by Poutanen’s sound installation, which exposes the surface to the senses, to exploration and auditory probing, to an attempt at uncovering the existence of something that evades conscious perception in the events and situations shown on the surface of the painting. Maybe that ‘something’, let us call it variable x, has been waiting for exactly this moment, the very moment of the birth of this work of art, in order to be encountered as ‘otherness’. Antero Kahila is a Finnish visual artist and a painter. In his latest series of work Kahila has dealed with alienation and withdrawal. His art explores the boundaries of human understanding and seeks answers to impossible questions. It explores the being of the world in us; Where does the self end and the world begin? Where and what are the beginning and end of a subject that one seeks to understand? This is Kahila’s second exhibition in Toolbox. During the last few years he has made several co-operation projects with poet-musician and actress Kirsi Poutanen. Poutanen is a well-known singer and musician in Finland, especially for her skills in Portuguese fado music. She has released a number books of poems and also been seen on theatre stages as an actress, performer and as a scriptwriter. Sieben Maßnahmen zur Bedeutungsfindung 2 ist ein Gemeinschaftsprojekt des Malers Antero Kahila und der Dichterin und Musikerin Kirsi Poutanen. Den Anstoß für das Projekt gab Poutanens Gedicht Das Kind ist erstaunlich (aus dem Gedichtband Villonin puutarha, Helsinki: Tammi 2014). Die multidisziplinäre Installation besteht aus drei verschiedenen Elementen und ist das Ergebnis einer Kettenreaktion: erst war das Gedicht, das das Gemälde inspirierte, das wiederum den Impuls für das Soundpiece gab. Im Galerieraum ist zu einem großen Gemälde von Antero Kahila das Klangstück von Putanen zu hören, das die Oberfläche des Gemäldes der Sinnenwahrnehmung öffnet, der Erkundung und dem hörenden Tasten – dem Versuch, die Anwesenheit von etwas zu erspüren, das sich bewusster Wahrnehmung entzieht. Vielleicht hat dieses „Etwas“, man könnte es Variable x nennen, genau auf diesen Augenblick gewartet, auf genau diesen Initialmoment des Kunstwerks, um als „Anderes“ erfahren zu werden. Der finnische Maler Antero Kahila beschäftigt sich in seiner jüngsten Werkserie mit den Themen Entfremdung und Rückzug. Er lotet die Grenzen menschlicher Verstehensfähigkeit aus und sucht Antworten auf unmögliche Fragen. Seine Arbeiten erkunden die Welt in uns: Wo hört das Selbst auf und wo beginnt die Welt? Wo und was sind Anfang und Ende des Subjekts, das man zu verstehen versucht? 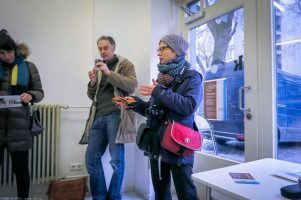 Sieben Maßnahmen zur Bedeutungsfindung 2 ist Kahilas zweite Ausstellung im Projektraum Toolbox. In den letzten Jahren haben Kahila und Poutanen einige gemeinsame Projekte entwickelt. Kirsi Poutanen ist in Finnland besonders als hervorragende Fado-Sängerin bekannt, darüber hinaus hat sie einige Gedichtbände veröffentlicht, ist als Schauspielerin und Performance-Künstlerin auf Theaterbühnen aufgetreten und hat Drehbücher geschrieben. 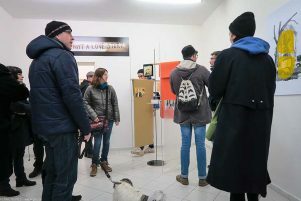 ArtHelix Gallery and Shim Art Network in collaboration with Gallery/project space Toolbox and okk|raum29. A guild /ɡɪld/ is an association of artisans or merchants who oversee the practice of their craft in a particular town. The earliest types of guild were formed as confraternities of tradesmen. They were organized in a manner something between a professional association, trade union, a cartel secret society authority to enforce the flow of trade to their self-employed members, and to retain ownership of tools and the supply of materials. In January of 2017 organizing an exhibition of artists that wanted desperately to show their revulsion at the election of, and swearing in of President Trump was both a necessary, and yet sadly, somewhat typical reaction by the art world. What Barry Carlsen and I had in mind was something different. We saw this moment as a time to not only register our individual confusion, outrage, and disgust; but as a moment to institute a potential structural change in the ways those emotions could be more permanently expressed collectively. 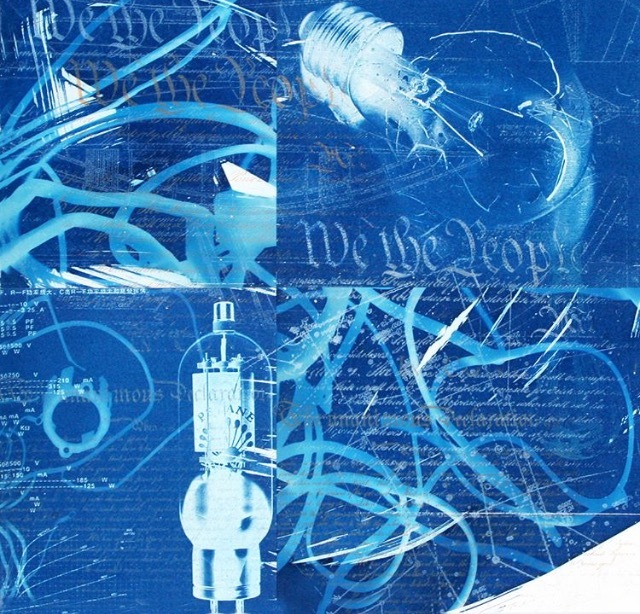 As printmakers, or more correctly as artists who also love and embrace traditional printmaking, we both knew the long history of artists- from Goya, Daumier, and Kollwitz, to Wangechi Mutu, Wendy Red Star, and Lorna Simpson- who have made printmaking a historically powerful tool for holding power up to some form of public accountability, and because by definition printmaking is a way to make an image reproducible, and thus democratically (small D) available to many at low cost the inherent nature of printmaking was a perfect vehicle for our new concept. However, the real irony is that to imagine this new sustainable organization that could carry out a long term goal of bringing together many artists into a shared community, yet retaining individual voices inside that group we finally turned to a model that was a thousand years old…the guild. The guild as referenced above in Wikipedia is a shared association of tradesman who negotiates for mutual benefits and protects the interests of its members. The guild we envisioned would be different in that in would not be a local, or geographically based version as it was in medieval times, but rather a global network that relies on social media to connect and promote one another. 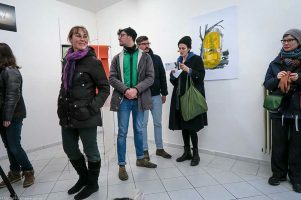 The guild could then grow to accommodate all the artists within it, while maintaining the core purpose of the reproducible image using traditional printmaking media. Once conceived, the guild, now named the Vox Populi Print Collective needed to resolve a second important problem. How to bring these artists and their works from distant points efficiently? For this we turned to the concept of only sending the print itself, and purchasing the frame in the locale of the exhibition. So we determined for the inaugural exhibition of the guild, and possibly thereafter, the prints would be made in one standardized size to allow the guild to have multiple sets of frames available by utilizing the Ikea global store system. We could now quickly and cheaply send these exhibitions around the world in a low cost manner. The costs of producing exhibition catalogs also became easier by making all the prints one size. Lastly Barry and I decided the first print of all the artist editions would be one low price. The artist would then be free to change pricing for their own works according to their own market value after the first print was sold. The final issue was to find a series of galleries and art fairs nationally and internationally that the guild could apply to. Here is the part I am most proud of. In the past three years I and several other partners have been hard at work creating a novel approach to creating ways for artists to engage the art world. Rather than a gallery based model that asks represented artists for commissions, our company, the Shim Art Network, allows artists and groups of artists to apply using fees instead of commissions. So the guild could now locate and apply for shows in New York City, Berlin, Miami or elsewhere with membership fees and retain all sales for the individual artists. The ultimate aim is for the guild or any group to function like a gallery minus the fixed cost or overhead of owning its own space. Vox Pop is just the beginning, but it is a crucial beginning for this idea. Artists coming together to share costs and lower risk while retaining their individual identities inside a global shared network can, and we are convinced, will change the very structure of the art world. We smile thinking to begin that journey we needed to embrace and re-engage an idea that was hiding in plain sight for two or three centuries. Ultimately Response, the title of our first show, and of this catalog is then both a tactical and strategic “response” to the growing global white supremacist, neo-liberal hegemony. Tactical, because over 60 artists from around the world have been willing to join in to this exhibition, and by doing embrace the resistance to this person and to what he represents to them, and that is something we must all be willing to do if we wish to see change. At another level however, there is a strategic shift in the ways we can express that dissatisfaction. By creating a group, a guild, a collective we are announcing that we are not alone in this struggle. That by relaxing for a brief moment our own autonomy we actually become stronger as individuals, and by extension we are now committing to a possible new economic model for artists. Shared risk groups bargaining for themselves with markets. This way we can begin to expose the lie that undergirds the neo-liberal economic myth of “winner-take-all” and “each for themselves”. The “shame” of the unrepresented artist, who cannot find a foothold inside highly regulated “space” where the cultural dialogue is produced, slowly gives way to the networked artist collaborating with others on specific projects that can be self-funded without waiting for institutional approval. I am proud to be a part of the Response exhibition, but I am more excited to be a part of the new emerging response to self-imposed isolation, sadness, and alienation from others who share in my goals for a different world. Liminal: etymology “limes” (Latin) meaning threshold. 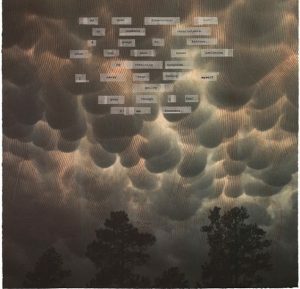 The word liminal is used in connection with: (1) a transition period or the initial stage of a process, (2) that something occupies a position, or both sides of a border or threshold. Liminal condition can be described as a place where we are open to anything; where we leave the “ordinary” and allows something else to occur. The transition can be described as passing a threshold or break through a membrane. The shift may be perceived as intimidating as the need for control is suspended, but at the same time a possibility for change and renewal. 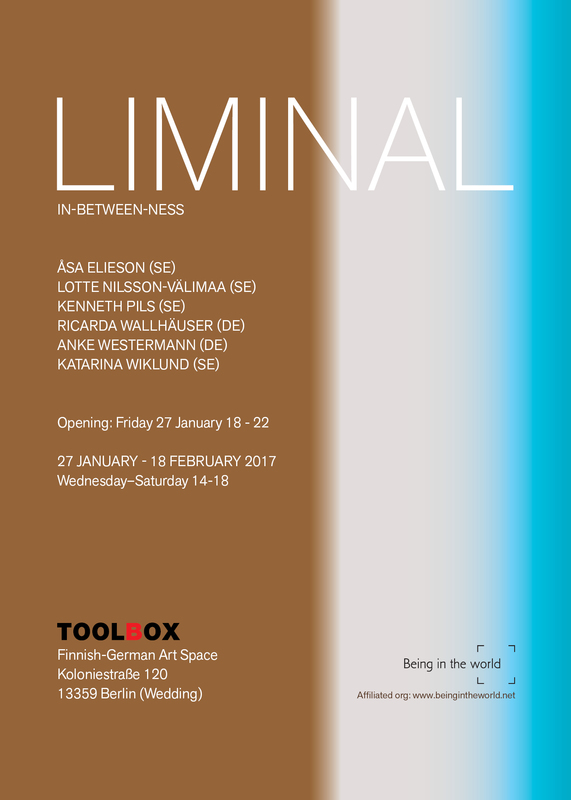 The liminal in-between space is characterized by openness, active listening and adherence to things that occur. How does a liminal place feel; where can you find it, and what does it look like? In the project “Liminal” the participants gives their vision on the theme. Art can open doors and let us enter places in new ways, not available before. The project is part of “Being In The World,” an international and interdisciplinary practice-based art project that explores temporal and spatial perception. The idea is that participants work together to come closer to the topic, get together, discuss it and make new works. Frauke is a choreographer with a focus on butoh and performance. She is based in Gothenburg, Sweden, but also does work internationally. The videos for this year’s Performance Voyage have been published and the project has started its world tour. 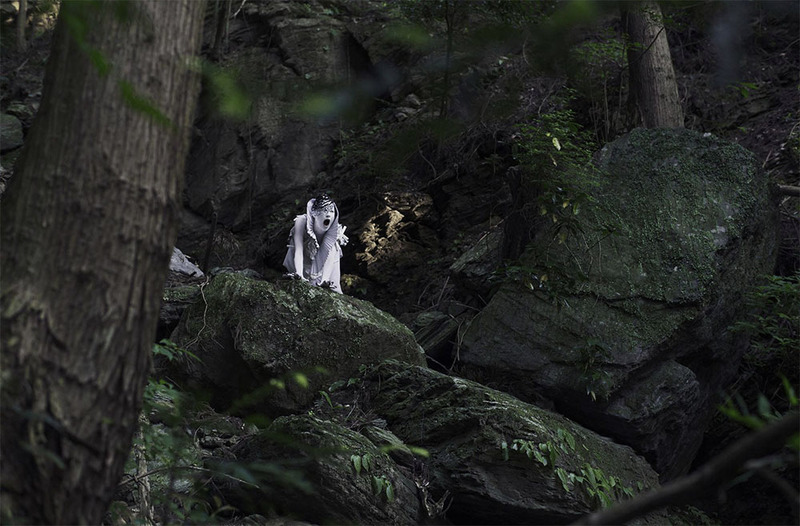 The collection is a series of international video performances produced by Artists’ Association MUU. 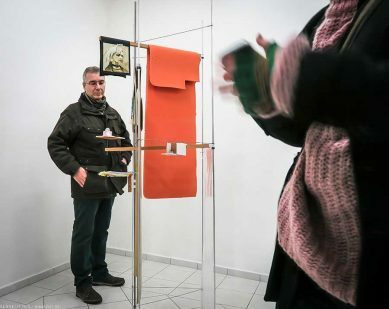 The premiere exhibition at the Finnish Institute in Stockholm was festively opened on the 10th of March. 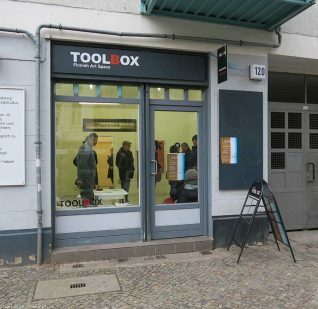 The next screening will be held on the 18th of April in the Projektraum TOOLBOX – Finnish-German Art Space, Berlin, Germany. The tour compilation of 14 video performances will be shown as a part of the international Index Performance Festival. The spring season’s other tour locations include Wrocław. James Duesing (USA), Roberto Fassone (Italy), Rick Fisher & Don Rice (Canada), Andrew de Freitas (New Zealand/Canada/Brazil), Stefan Hurtig (Germany), Henri Hütt (Estonia), Linda Lenssen (The Netherlands), Michael Mallis (USA), Roberta Orlando (Italy), Johanna Reich (Germany), Pia Sirén (Finland), Niko Skorpio (Finland), Willem Wilhelmus (The Netherlands/Finland) & Tomasz Szrama (Poland/Finland). The tour continues in the summer with locations in France, USA, Italy and elsewhere. Additional information later! The works in Performance Voyage 6 were chosen from submissions received in response to an international open call. The theme Future/Tomorrow inspired artists to explore our ever receding future and search for thing as-yet-to-be, whether future hopes or dystopias of desperation. How do we see the future? What hopes, fears and expectations does it awaken in us? Artists around the world were invited to send in their visions of the future, which could be the literal tomorrow, the world in the year 2050, or something inexplicably far away from us both in time and in space. 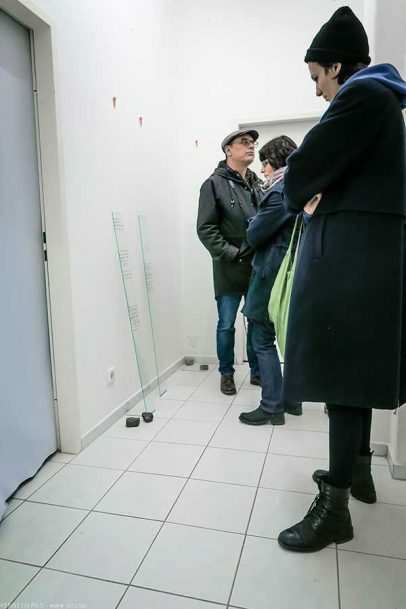 The works were selected by a jury composed of Annette Arlander (artist and professor), Juha-Heikki Tihinen (curator, Pro Artibus Foundation) and Timo Soppela (director, MUU). 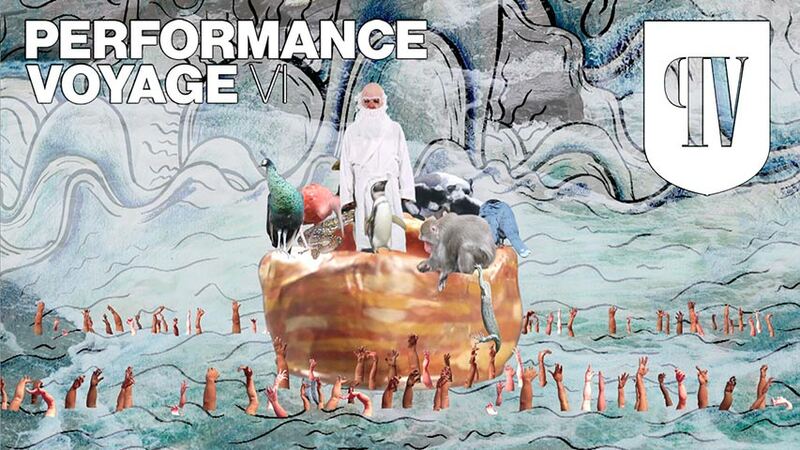 PERFORMANCE VOYAGE SINCE 2011 – The Performance Voyage project was launched in 2011 as an ancillary event of the Amorph! festival. Since then it has become a staple part of the annual project operations of MUU, and it has increased in prominence every year. The purpose of the Performance Voyage project is also to record and document transitory performances and thereby to extend their life also beyond the moment itself.